In a lot of video games (especially RPGs), it’s common that there are some parts of the game that are… should we say, tricky to figure out. Whether it’s the obscure solutions to puzzles in old school adventure games, the one in sixty million rare item drops in old school RPGs or just crap like that damn barrel in Carnival Night Zone, guide dang it moments are all over the place in the gaming world. But even compared to its competition, Mario & Luigi Paper Jam is an extreme case. From items dropped only by enemies using certain attacks to hidden paths the game barely hints about it, it’s absolutely littered with things that only a psychic (or keen walkthrough reader) can figure out. Scratch that, probably not the latter, since the game doesn’t have an official walkthrough. Nor will it ever be getting one (people have asked Prima). So for the sake of any completionists out there (and bored people wanting to laugh at stupid game design decisions), here are the six biggest guide dang it moments in Mario & Luigi Paper Jam. Why six? Because we were bored, and it’s a slightly better number than five. First on the list, is something that’s not too difficult, but annoying enough to trip up the unwary. Trying to figure out a Boomerang Guard sequence and how to beat it. This is because while the other two ‘chase’ sequences have simple solutions and mechanics (Airplane Guard has you merely dodging obstacles by jumping over/steering round them, Trampoline Guard has you bouncing an object back at the boss), Boomerang Guard ones… don’t. In fact, there are cases where two very similar situations have to be dealt with in the complete opposite way, really screwing up the unwary. Kamek and Paper Kamek: Destroy the wall of Paper Kameks, then hit Kamek enough times so he hits himself. Lemmy Koopa: Hit Lemmy Koopa so he falls off the ball he’s riding. Seems simple, right? Well not really. 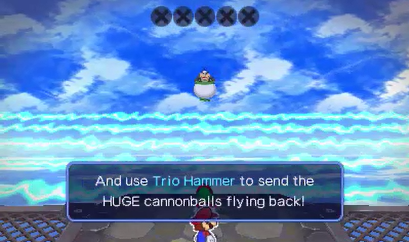 You see, Trio Hammer is not one button press, but a series of attacks ending with a ‘mega strike’ that’s much more powerful than the first two. So with that in mind, what do you expect to do here? Well, if you’re most people, you expect to hit the incoming giant cannonball with the last strike of Trio Hammer. After all, that’s the powerful one, right? Nope. You do that, you’ll quickly lose. Instead, you have to hit the cannonball with the first strike, at which point it’ll hang in the air for about two seconds. You then have to follow it with the last two strikes. How the heck does that work? It’s like playing cricket or baseball, except you don’t swing the bat at the oncoming ball, you hold it still to block said ball (freezing it in mid air), at which point you THEN swing the bat. What a confusing as hell control scheme. Before the fight with the two Bowser Jrs in Bowser’s Castle, you have to catch them at the end of a fairly painful, annoying stealth sequence. Even with two parts, it’s arguably not that bad (you get a checkpoint after the first one, and have unlimited goes), but still, the first section is a gauntlet of enemies. How do you get past it? Well, you could be really good at timing yourself and sneak past the many, many watchful enemies while their backs are turned. But the margin for error is slim. Pretty easy, isn’t it? Well, good luck figuring that path out on your own. It’s designed to look like a completely irrelevant side area that has nothing except a trap in it, yet turns out to be the easiest route forward. Aka the Toad hunt from hell. Seriously, look up the missions that people are having trouble with. This one ranks very, very high on the ‘amount of people asking for help’ ladder. And trust me, there is a very, very good reason for this. Namely, the Toads behind the shop buildings. You see, when you check behind a building, there is supposedly a one in three chance you’ll find a group of six or so Paper Toads hiding there. Simple right? No, because people have done this over and over, and sometimes failed to find Toads after tens or hundreds of tries. That’s because what the game never tells you, is that the Toad hints you’re given elsewhere in the village are a clue to which building the Toads are hiding behind. Namely, the building the Toads aren’t described leaving, is the one they’re hidden behind. So if the game says a Toad went into the card shop, left to the item shop, didn’t go to the Lakitu Centre and visited the Gear Shop? Well, guess what? The Toads are behind the Gear Shop, cause they never left. But this is confusing. Why? Because Toads are also found inside these buildings. So to an average player, the descriptions could easily be confused for places the Toads are hiding inside the shops. And when the descriptions don’t match up? Then it initially appears like the Toads are the equivalents of the villagers in Castlevania 2; morons who deliberately mislead the player for kicks. It also never mentions that the Toad locations are randomised after every mistake. That’s why you get a lecture from the Toad squad when you accidentally encounter a Fuzzy… because they’re hinting at the new location the Toads ran off to. Good luck figuring this one out, especially if you don’t have a walkthrough handy. Most people (including near enough all Lets Players) just brute force the gimmick. Enough of mini games though, now onto one of Mario & Luigi Paper Jam’s most confusing aspects. ‘Special’ enemy drops. In normal games (like most RPGs), random drops are simple. You defeat an enemy, and there’s a chance an item will appear. Sometimes that’s a high chance (like for common items), sometimes that’s about one in fifty million (like for the most powerful pieces of clothing or weapons in your average JRPG). It’s fairly simple, since you only have to keep grinding til the item appears, which it usually will after enough tries. Not in Mario & Luigi Paper Jam. This game has ‘special’ drops. These only appears when a certain attack is used, a certain in battle condition is met, or a certain mission set up is in progress. And one of the worst examples, are Nabbit’s gear drops. In his last mission, you have to chase him through Neo Bowser Castle, changing between fighting against him for coins or helping him battle enemies to get past Bowser’s forces. Every coin you get adds up in a counter at the top of the screen, and at the end, you get to keep the money you’ve earned. Simple, right? You see, what he drops last is based on the amount of coins you have. You get coins by collecting them as he throws them in an attack, jumping on his bag as he chucks that in a second attack or hitting him extremely hard with one of your Bros or Trio Attacks. If you get hit on the other hand, you lose coins. Oh wait, not quite. No, he also drops coins if he messes up his special Buzzy Beetle shell based Bros Attack. Or if he gets hit while you’re fighting alongside him. These presumably end up in your collection as well. And there are also times you can catch him right before he encounters an enemy, with about a ten second margin of error. Miss that, and that’s a good four hundred coins down the drain. Or the Farmer Boots, if you’re American and apparently don’t like complicated English. How complex is it to get these? Didn’t get it? Well, there’s a rare versions of a Broozer called a Shiny Broozer, with a low chance of appearing. This enemy can sometimes use an attack where it chucks barrels at the characters. If the barrels are broken, there’s then a low chance an item box falls out. There’s then at least a one in seven chance the item box will contain the Wellington Boots. So you’ve got a rare, endgame enemy, which drops a certain (great) piece of gear. And this is only happens if it uses a certain attack. And the random number god likes you that day. It’s even worse if you’re unlucky, since you can blow through 50, 100, 200 Boo Biscuits before the boots appear. That can easily be a good eight or so hours of non stop dodging attacks. There’s no chance in hell anyone will find these without hacking the game, finding a guide or deliberately looking for them. Above: They are useful when you get them though. And those are what we consider the six biggest guide dang it moments in Mario & Luigi Paper Jam. Well, at the moment anyway. It’s pretty likely that at some point, even more nearly impossible to figure out secrets will be found, likely by the first guy who successfully hacks the game and compiles all the data somewhere. But what do you think? What moments in Mario & Luigi Paper Jam did you find the most confusing to deal with?